How can different numbers of missing teeth be replaced by dental implants? 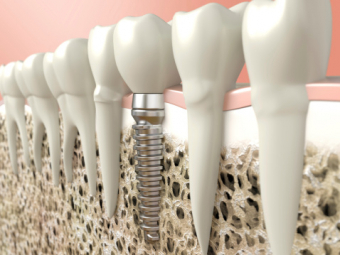 If you're missing one or two individual teeth, each can be replaced by an individual implant, abutment, and crown. This is the case whether or not the teeth are next to each other or not. Three or four missing teeth in a row can be replaced with two implants, two abutments, and three or four artificial teeth (for aesthetic purposes) in the form of a bridge that is attached to the abutments. If you have more than 4 missing teeth, they can be replaced in much the same way, but with increasing numbers of implants and artificial teeth. 6-7 missing teeth in a row can be replaced with 3 implants, 8-10 missing teeth with 4-5 implants, and 9-10 missing teeth with 4-6 implants. To replace all 14 teeth in the upper or lower jaw, no more than 8 implants are usually necessary. It is important to note that the above numbers are just guidelines; the number of implants you end up with also depends on the bone volume of your jaw, and the size and position of your remaining teeth. Those with small jaw bones or those who have experienced bone loss as a result of having missing teeth for a longer period of time may require a bone graft procedure in order to place the required number of implants. 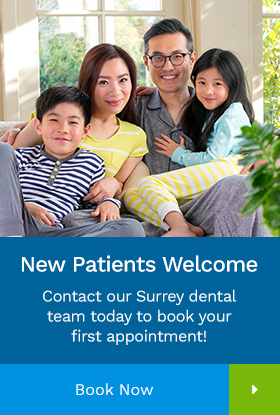 To determine the teeth replacement option for you, contact our Surrey dentists today for a dental implant consultation.